What a year! It all started with this post on July 3rd, 2012. If you like the Finding Nemo seagulls, then check out the video at the bottom of the post. See how long you can bear to listen. I give it 30 seconds tops. Oh, and the post had a uniquely spiritual message about ownership that I continually have to revisit to this day. I’m not sure what I was expecting last year when I started this blog. All I knew is that I had an idea, a passion and had finally worked up the courage to share those with others. Some people have no problem sharing on such a public forum like the Internet. I did. It was the biggest obstacle I had to overcome when starting Luke1428. So in many ways, July 3rd is my personal independence day – the day I broke through some mental and emotional barriers and became willing to open myself up to the world. Some things have changed here in the past year, including the free theme you see in the screenshot above. I’ve realized since my upgrade how un-functional that theme was. That’s part of the blogging learning process though, and I don’t regret using that because a great looking theme was not part of my original goal. RIP Designfolio. Other things have not changed. I have so many ideas to write about I find myself frustrated that there is such a backlog piling up. My passion for sharing and interacting with others has remained steady (if not increased), much to my shy personality’s surprise. I still believe in my mission to blend and integrate useful content with my faith in a way that is easy to understand and inspiring to my readers. And I also enjoy having a little fun along the way as my regular readers can attest to. Speaking of my readers, I wanted to say a special word to everyone that has commented here in the past year. Your interaction has helped grow my blog and has made the experience especially valuable for me and others who have read here. I feel like I know many of you very well even though I’ve never met most of you in person. I would not have had as near as much fun without you. Oh, one last poster I forgot to mention – Mrs. Luke1428. It’s because of your encouragement I was able to start this adventure one year ago. Words cannot express the joy I experience each day being a part of your life. You are simply the best! What does year two hold? There are some goals and challenges for myself that I will share at a later date. I hope you will continue to grace me with your presence here and share what you find profitable. Thanks again! What do you remember about your first year of blogging? What is the most valuable thing you have found here at Luke1428? How have I helped you? Prior Post: Investing Made Easy (Part III): Where Should I Put My Money? Thanks Deacon! I’ll try to be a more frequent visitor. 🙂 I like what I read at your site. It’s so easy to get lost in the blogosphere with so many great sites around. Happy 1 year! I haven’t made it to my one year anniversary yet so I don’t have any first year memories yet. I always enjoy the personal posts you write. The ones about lessons you’re teaching your kids are touching and memorable to me. Thanks for that feedback…I enjoy doing those. We need the technical how-to stuff on our blogs but I love personal stories. Thanks for your involvement here in the past year. I really appreciate it! Thanks! Appreciate your comments here through the past year. Congrats on one year! Can’t wait to see what the next one holds! Thanks Kim! I appreciate your support here. Happy Blogiversary, Brian! I’m glad we connected this past year and look forward to seeing more great things here. Thanks for the shout-out, I appreciate it and your support to my blog as well.! Happy 4th of July! Thanks Shannon! What you talk about in relation to parents and kids is right up my alley. You’ve been a big contributor here and I appreciate it very much! Thanks Cat! Appreciate you stopping by my blog and sharing. I enjoy your fun perspective on things. Thanks Laurie! And thanks for the feedback. Like many in the PF blogosphere, I truly want to be a source of encouragement and hope for those who need it. Sometimes it’s hard to tell the impact one is really having. Makes me feel good knowing knowing you have been helped by some things you’ve read here. Big congrats Brian! You’re doing great and can relate to much of what you wrote. I am a bit introverted as well, but find it’s easier to shed that in the blogging space. I’ll be hitting the year mark in about six weeks and it has been quite the whirlwind. Thanks so much for the special shout out, I really appreciate it! Thanks John! You’ve been a great support to me. Thanks for finding time to comment here in the midst of your crazy schedule. Appreciate it a bunch! Congratulations! I can relate to being shy as I am an introvert as well, but I find it a lot easier to connect with people online. Plus the PF community is so accepting. I am a new reader but I look forward to more! I think you are right about connecting online with people being easier. I have found the confrontation and negativity to be far less than I expected. Congrats on one year! Looks like we started pretty much the exact same time. The only problem with my site is I haven’t upgraded my theme yet 😉 I definitely have that on my to-do list, or at least to learn more about coding so I can customize my theme further. I appreciate you listing me and you make my 1 year post look lazy because I only listed a few blogs haha. Here’s to a great year 2 for both of us! Thanks DC! The theme I’m using from StudioPress made the transition very simple. I’m sure all their themes are like that. 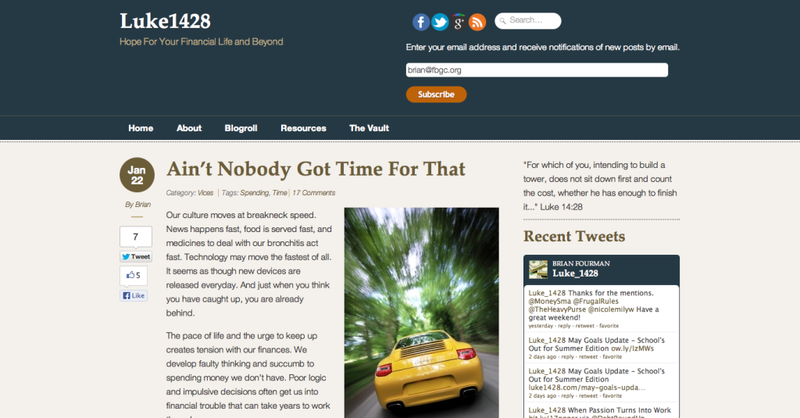 I pretty much had my blog re-organized and formatted basically the way I wanted in about three hours. I’ve just added bits and pieces since then. I know very little code…the best thing is you can find most of the code you need for really simple things by doing a Google search. Congrats Mr. Fourman. I remember when you were asking us for ideas on what to name this. I enjoy reading your posts. Keep it up. Enjoy your summer. See you in August maybe before then. Happy Blogoversary! That one year mark is definitely a milestone because it’s hard to keep up and be committed! I’ve always enjoyed your blog and viewpoints, and happy we have made the connection! Best of luck to you and this blog in the next year! Thanks Tonya! It was harder than I anticipated, doing this for one year. I’ve always read that the 1-yr. mark is a big milestone to reach. Now that I’m here, it feels really good. Happy one year my friend. That is quite the accomplishment. My one year doesn’t come until the end of August, so I can’t give you a full insight about my one year of blogging on DR. I appreciate you mentioning me and I am happy to stop by to comment. I enjoy your work. Keep it up and hopefully year two will be better than the first. Thanks Grayson! I’ve learned so much in my first year about blogging but still have much room to grow. I hope to correct some of that in year two. Happy blogoversary Brian, and congrats on regularly posting for a year! mine is only a few days away as well, that year flew by. Here is to many more! Thanks Pauline! Regular posting has been more of a challenge than I thought. But that was the goal I had and am proud I made it.